August 2011 – MidwestAthleticConference.com – The Official Site of the Midwest Athletic Conference for mac news, mac scores and more. Coldwater-Delphos St. John’s Football Game to be featured as a part of the iHigh Great American Rivalry Series. The Coldwater vs. Delphos St. John’s football game on Friday, October 7th at 7:30 p.m. has been selected from ihigh.com to be part of the Great American Rivalry Series. 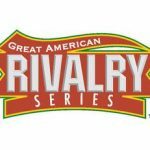 Below is some information about the Great American Rivalry Series. More information can be found at their website at www.ihigh.com/greatamericanrivalries. The Great American Rivalry Series is for “every player” who will go on to become the town’s pharmacist, councilman, or business owner. There is no other venue like the Rivalry Series to bring something more memorable to the player, their families, the fans, the coaching staff and the community. This is high school football at its best! The Greatest Rivalries in the country. This is Friday night in America! Select schools from around the nation are invited to participate in the Rivalry Series. These schools have always had “their game” – a traditional rivalry going back many years. Thousands of players have participated in this memorable event and every year the rivalry creates it’s own special memories. It is “the game” the one the whole community looks forward to and talks about all year long. The Rivalry Series not only celebrates high school football, it embraces it’s excitement, traditions and history. A donation is given to the host team for their football program as well as two college scholarships awarded to a player from each team in the rivalry. 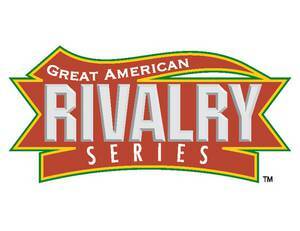 The Great American Rivalry Series strives to preserve the integrity of amateur sports and to bring “every player” something to remember for the rest of their life. This is THE GREAT AMERICAN RIVALRY SERIES. By admin|2011-08-02T09:56:27-04:00August 2nd, 2011|Coldwater Cavaliers, Delphos St. John's Blue Jays, MAC, News|Comments Off on Coldwater-Delphos St. John’s Football Game to be featured as a part of the iHigh Great American Rivalry Series.